This article provides an overview of the data-related roles and responsibilities when you’ve chosen Everhour as your time tracking and invoicing platform and will explain Everhour’s efforts to live up to the values and requirements of the GDPR. When you sign up for Everhour, we ask for your name, email address, country, and company name. This allows us to personalize your new account, and send you invoices, updates, or contact you concerning your account. We’ll never give nor sell your personal information to third parties. Everhour acknowledges that EU and Swiss individuals have the right to access the personal information that we maintain about them. An EU or Swiss individual who seeks access, or who seeks to correct, amend, or delete inaccurate data, should direct their query to ask@everhour.com. If requested to remove data, we will respond within a reasonable timeframe. Users of Everhour can store any type of information in Everhour, but Everhour does not access or share that data, and does not know what type of data you or other users are storing. The data is only used by the account owner and invited users as they intend to use it. Therefore, the data you store in Everhour is your data subjects, and you are considered the data controller for this personal data. Using the Everhour app to manage your customers and projects means that you have engaged Everhour as a data processor to carry out certain processing activities on your behalf. Sensitive personal data, such as health information or information that reveals a person’s racial or ethnic origin, will require even greater protection. You should not store data of this nature within your Everhour account. Additionally, Everhour acts as the data controller for the personal data we collect about you, the user of our web app, mobile app, and website. Secondly, we process data to meet our obligations under the law — this primarily involves financial data and information that we need to meet our accountability obligations under the GDPR. Thirdly, we process your personal data for our legitimate interests in line with GDPR. What are these ‘legitimate interests’ we talk about? Making sure that your data and Everhour’s systems are safe and secure. In the context of the Everhour application and our related services, in the majority of circumstances, our customers are acting as the controller. Our customers, for example, decide what information is uploaded or transferred into their Everhour account (our ecosystem). Is Everhour using third-parties to process data? 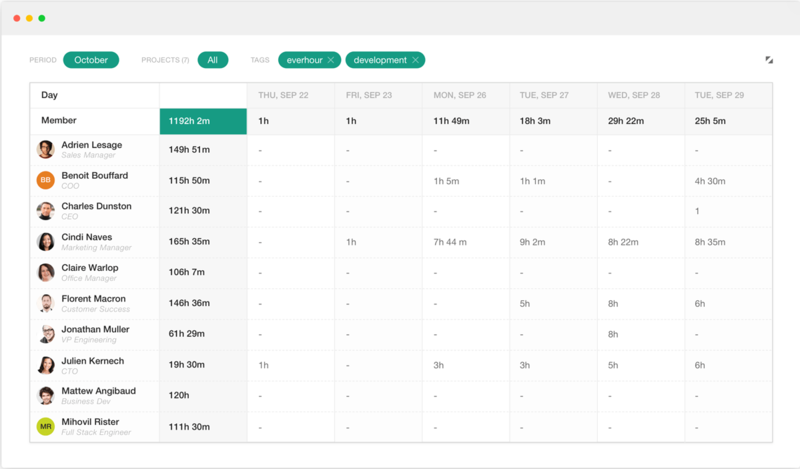 Everhour, just like any other business, currently uses third-party Subprocessors to provide various business functions like business analytics, cloud infrastructure, email notifications, payments, and customer support. The Everhour website and Service has industry standard security measures in place to protect the loss, misuse, and alteration of the information under our control. While there is no such thing as "perfect security" on the Internet, we will take all reasonable steps to insure the safety of your information. When you use the Everhour Service we and our vendors may use “cookies”, “web beacons”, and similar devices to track your activities. These small pieces of information are stored on your hard drive, not on the Everhour website. We do keep backups, designed for catastrophic system recovery, for 30 days. The backups are purged on a rolling 30 day cycle. When an account is deleted, none of your personal data will remain on our servers past 30 days. Anything you delete from your account while it’s active will also be purged from the backups at day 30. Deactivated users will no longer have access to your account, but their name, email addresses, and time entries will remain in your account for historical reporting purposes. Our customers enjoy full data portability using our API, which allows them to easily access their data in a portable way as well import data from other systems. Additionally, you can export all company time data and invoices from the Export section of Account Settings. Which data you can export depends on your user permissions. We are working with our customers to answer any questions and address any concerns regarding how we protect their personal data and gearing up for GDPR. If you have any questions, please don't hesitate to contact us at ask@everhour.com.